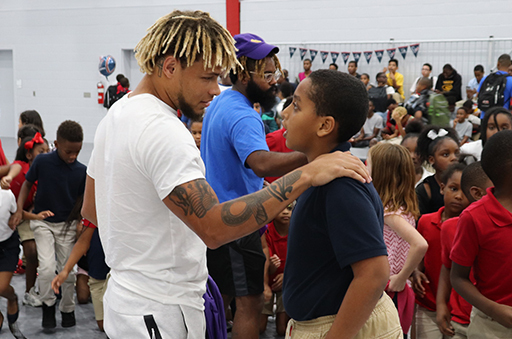 WASHINGTON, D.C. – Tyrann Mathieu has been named Week 0 NFLPA Community MVP for delivering 250 backpacks filled with school supplies to kids at the Boys & Girls Clubs of Greater Houston. Entering his first season with the Houston Texans, Mathieu wasted little time making an impact on his new team city. Along with providing resources ahead of their first day of school, the All-Pro defensive back took time to speak with the students about the importance of education while taking questions about adoption, motivation, training and mentorship. Mathieu also donated 250 backpacks to students in his hometown of New Orleans, further demonstrating his commitment to pouring back into the next generation. Through the Tyrann Mathieu Foundation, which was established in 2017, assistance is provided for financially disadvantaged children and youth through encouragement, opportunities and resources to achieve their dreams. Currently, his charity is working to implement Tyrann’s Tech Zones in local community organizations, fully upgrading and outfitting them with the technology needed to help students excel. In honor of Mathieu being named this week’s Community MVP, the NFLPA will make a $10,000 contribution to his foundation or charity of choice along with an in-kind donation to him on behalf of our supporting partner Delta Private Jets. A limited-edition bobblehead will also be made of Mathieu and sold by our supporting partner Forever Collectibles at www.sportsfanisland.comand www.foco.com. The NFLPA will donate part of the proceeds from this collector’s item to the player’s charity or foundation of choice. Mathieu, along with the other 2018 Community MVPs, will become eligible for this year’s Alan Page Community Award, which is the highest honor that the NFLPA can bestow upon a player.